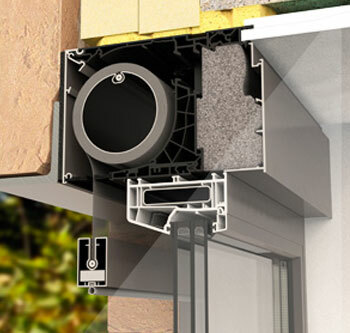 The Fixscreen® is the first external screen in the world that is truly wind tight. Thanks to an ingenious zip system, the fabric is wind tight in every position and can be insect-proof in the closed position. It is a simple principle by which the sun-protecting fabric has a special trim with a symmetrical zip which holds the entire structure firmly in the two side channels. Fixscreen®, the technological performer in terms of comfort and ease of use, can be used in residential, offices and project buildings. 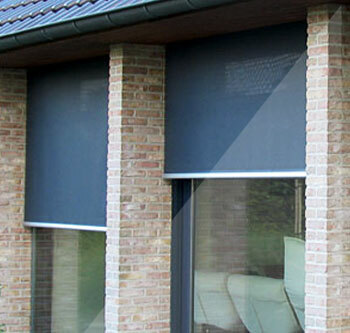 The extensive range of colours of the fabrics and the profiles ensures that the Fixscreen® is in perfect harmony with the architecture of your home or company, which automatically leads to a pleasant living and working environment. All materials used for the Fixscreen® are 100% corrosion-proof. Only stainless steel screws have been used. 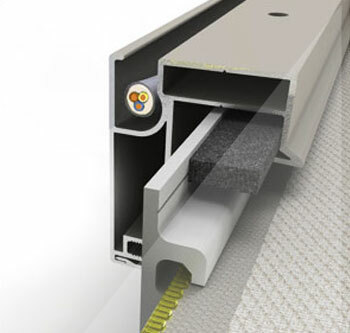 The aluminium profiles consist of an alloy EN AW-6063 T66. The profiles are available in every possible colour. SATER Sunprotection-Screens brings a major evolution in the quality, design and installation of large vertical sunscreens in freestanding position (Free). This offers a wide range of new mounting possibilities that contribute to the SATER Healthy Outdoor Concept. This concept aims to take the outdoor living space to a higher level taking three levels of comfort into account: Physical comfort, Thermal comfort and Visual comfort. Connect&Go® technology ensures that the fabric roller tube is easy to install and removed. We have optimized the design of the box in order to ensure that the bottom bar will disappear, up to 2700 mm high, into the head box without changing any dimensions of the box! 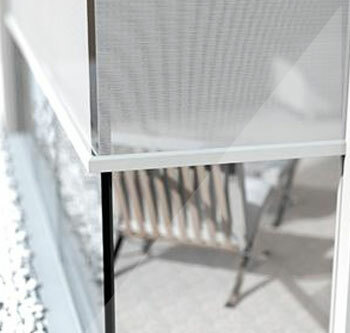 The Fixscreen® technology ensures that the screen is windproof in any position. Flapping and torn fabric are therefore things of the past. For the freestanding version we propose to integrate Crystal windows in the fiberglass fabric in order to have an open view towards the garden i.e. Fixvent® & Fixscreen® Mono AK EVO screen are two new concepts, each with their own specific features, yet easy to combine with each other in the same living space because of one look and feel. By placing all raampdieptes by a smooth sliding movement of the monobloc on the mounting profile. The introduction of the patented Connect & Go® technology, the fabric roller can now very easily (dis) are mounted. Like its predecessor 'Screen Vent Mistral' is the canvas thanks to Fixscreen® technology in any position wind resistant and are flapping and ruptured screen paintings of the past. The compact vertical solarshading for internal or external use. 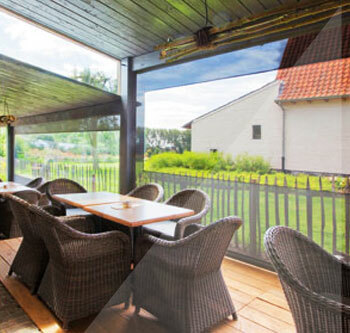 MINISCREEN® is a compact and intelligent solar shading screen with a contemporary design. The system has been developed to current standards and matches perfectly with the Healthy Building Concept. MINISCREEN® means maximum comfort at ‘mini’prices. The vertical solar shading is made to measure to the customer’s requirements with high quality screens for both external and internal use. MINISCREEN® perfectly controls light and heat. In addition, SATER offers a 5 year guarantee on this innovative sun protecting screen. The first sun protection for glass-on-glass corner windows. SATER, a trendsetter in sunprotection, follows architectural trends closely. “Invisible architecture” is a new trend that goes well with the desire for minimalism. SATER is taking perfect advantage of this development with the Panovista®. This new development is ideal for applications with glasson- glass corner windows, for which conventional screens fail to provide a solution. The Panovista® is a sunscreen for corner windows, keeping the unpleasant aluminium profiles or cables from being permanently visible in the corner. Both sides of the system are simultaneously rolled up or out, and in this way provide the desired shade for a living or work space, without losing the view of the panorama around the building. This solution is almost invisibly integrated into the building’s architecture. The box and side channels can be aesthetically hidden away and even the bottom bar disappears into the box once the screen is fully rolled up. SATER is a trendsetter in sun protection and closely follows new architectural trends. “Invisible architecture” is one such trend and nicely complements the desire for minimalism. SATER’s Slidefix also anticipates on the shift to “Invisible architecture”. 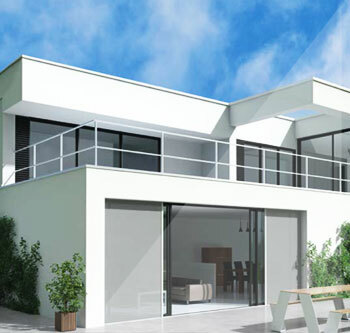 This new development with a horizontally opening screen is the ideal, wind-proof solution for large openings, sliding windows and corner solutions. Sater window and door shutters are an attractive way to help secure homes, commercial premises and corporate office buildings. Sater offers a variety of curtain design options, tailored to suit the requirements, from complete privacy to security with a view. Copyright 2017 Sater | All Rights Reserved.